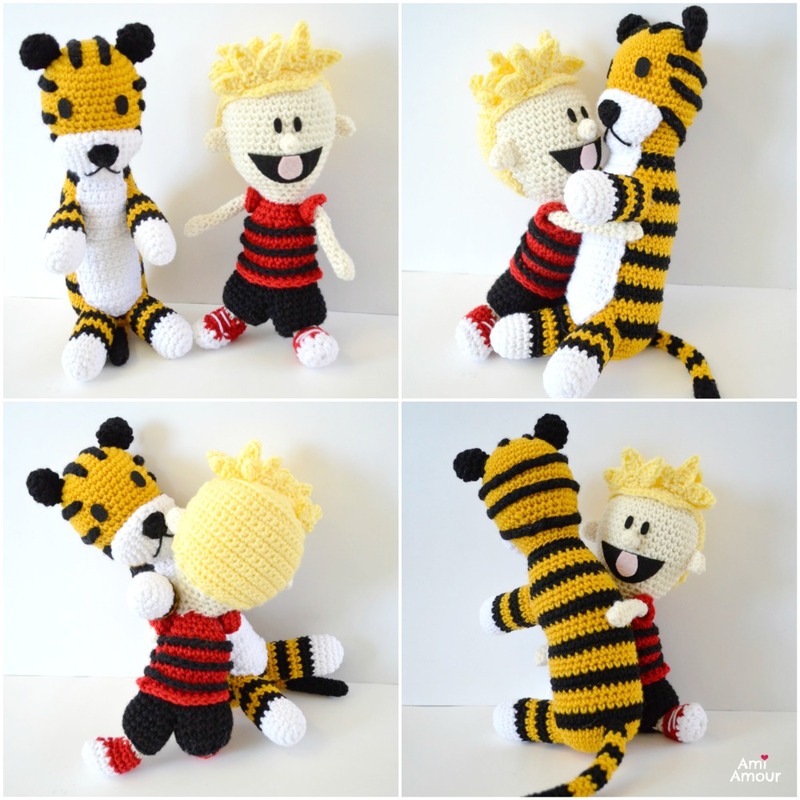 Here is a free Hobbes Doll amigurumi pattern inspired by the incorrigible tiger written so beautifully in the comics of Bill Watterson. 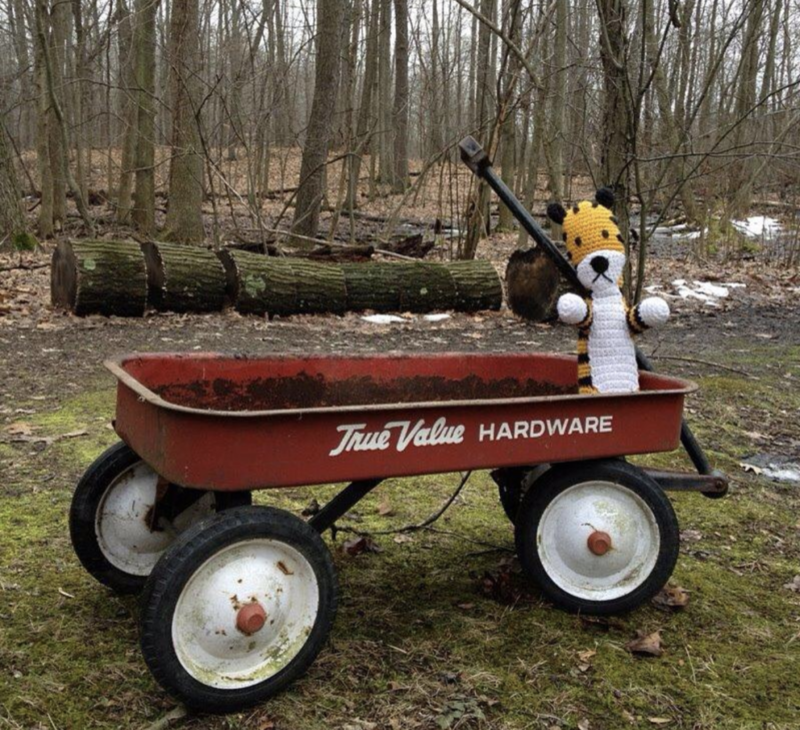 He is Calvin’s best playmate and wise tiger all rolled into one. 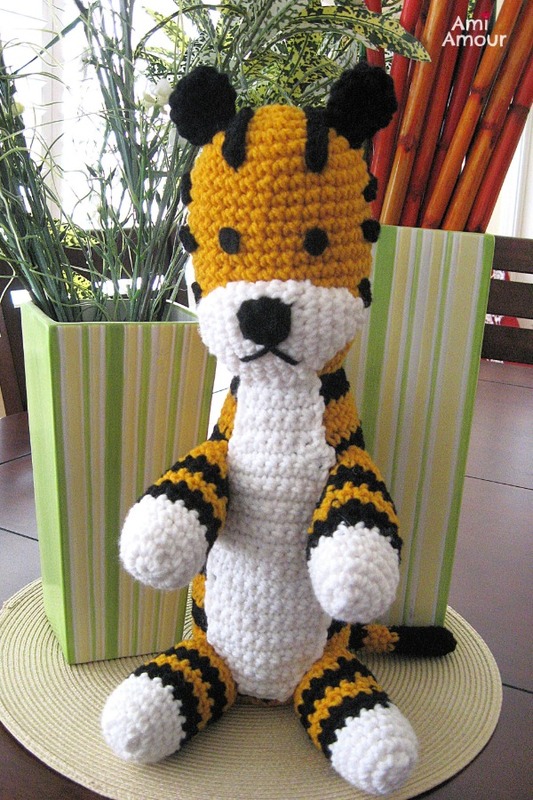 This loveable Hobbes crochet pattern features his gold and black stripes, elongated body, snout, and long tail. His favorite past time is to go exploring and his favorite food is tuna. 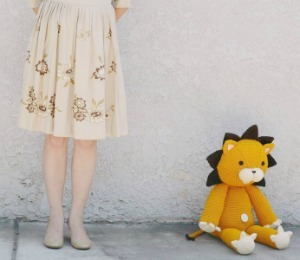 Beware, though, the tiger may want to pounce on you the moment you walk through the door! 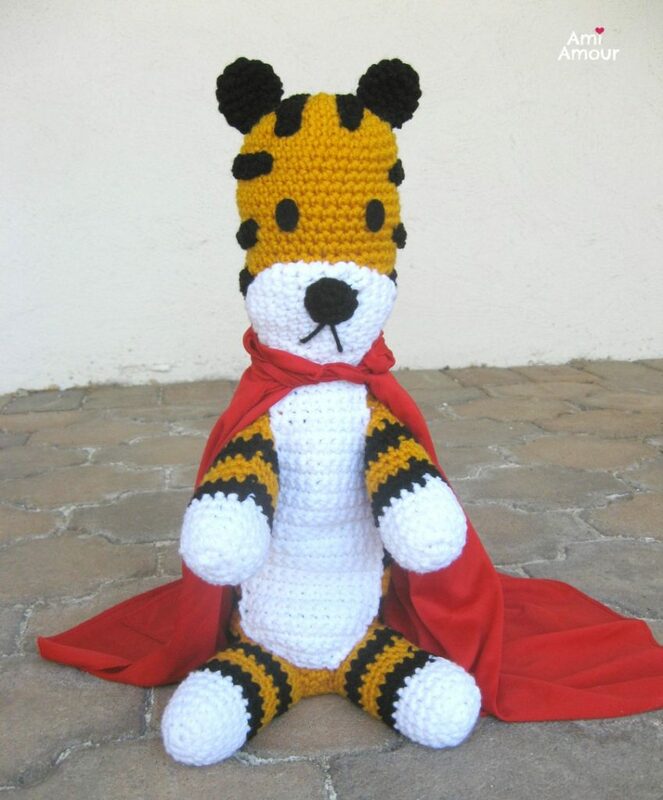 Please enjoy and happy crocheting and exploring with your tiger! 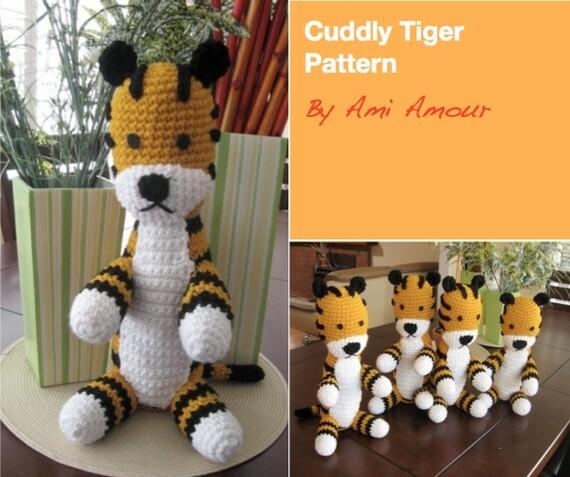 I’ve also created a video Crochet Tutorial that shows how to create this Tiger Amigurumi from beginning to end. 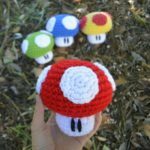 Crochet along with me! Round 1: With gold yarn, 6 sc into magic ring. Round 7-15: Sc in each st around. Round 16: [Sc2tog, sc in next 4 st] around – 30 sc. Round 18: [Sctog, sc in next 3 st] around – 24 sc. Round 19-21: Sc in each st around. Round 6: [2 sc in next st, sc in next 14 st] around – 32 sc. Round 8-9: With black yarn, sc in each st around. Round 10-12: With gold yarn, sc in each st around. Round 13-14: With black yarn, sc in each st around. Round 15-17: With gold yarn, sc in each st around. Round 18-19: With black yarn, sc in each st around. Round 20-22: With gold yarn, sc in each st around. Round 23-24: With black yarn, sc in each st around. Round 25-27: With gold yarn, sc in each st around. Round 28: With black yarn, [Sc2tog, sc in next 14 st] around – 30 sc. Round 29: [Sc2tog, sc in next 3 st] around – 24 sc. Round 30-32: With gold yarn, sc in each st around. Round 33-34: With black yarn, sc in each st around. Note: Should finish with 6 black stripes. Round 1: With white yarn, 6 sc into magic ring. Round 3: [2 sc in next st, sc in next 3 st] around – 15 sc. Round 7-8: With black yarn, sc in each st around. Round 9-10: With gold yarn, sc in each st around. Round 11-12: With black yarn, sc in each st around. Round 13-14: With gold yarn, sc in each st around. Round 1: With black yarn, 6 sc into magic ring. Round 2-7: Sc in each st around. Round 8-10: With gold yarn, sc in each st around. Round 13-15: With gold yarn, sc in each st around. Round 16-17: With black yarn, sc in each st around. Round 4: [Sctog, sc in next st] around – 8 sc. Round 1: With black yarn, 5 sc into magic ring. Round 2: Hdc in next st, [hdc, ch 1, hdc] in next st, hdc in next st, sc in next st. Round 1: With white yarn, 4 sc into magic ring. Round 4: [2 sc in next st, sc in next 4 st] around – 12 sc. Round 5: [2 sc in next st, sc in next 5 st] around – 14 sc. Round 6: [2 sc in next st, sc in next 6 st] around – 16 sc. Round 11: [Sc2tog, sc in next 6 st] around – 14 sc. Round 12: [Sc2tog, sc in next 5 st] around – 12 sc. Round 13: [Sc2tog, sc in next 4 st] around – 10 sc. Round 14: [Sc2tog, sc in next 3 st] around – 8 sc. 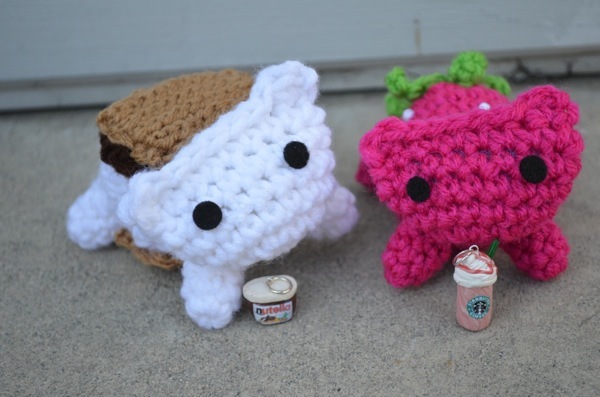 Round 14: Sc2tog around – 4 sc. Fasten off, leaving along tail. Sew closed without stuffing. Row 1: With white yarn, ch 5, sc in 2nd ch from hook and in each remaining ch across – 4 sc. Row 2: Ch 1, turn, 2 sc in first st, sc in next 2 st, 2 sc in last st – 6 sc. Row 3: Ch 1, turn, 2 sc in first st, sc in next 4 st, 2 sc in last st – 8 sc. Row 4: Ch 1, turn, 2 sc in first st, sc in next 6 st, 2 sc in last st – 10 sc. Row 5-16: Ch 1, turn, sc in each st across. Row 17: Ch 1, turn, sc2tog, sc in next 6 st, sc2tog – 8 sc. Row 18-20: Ch 1, turn, sc in each st across. Row 21: Ch 1, turn, sc2tog, sc in next 4 st, sc2tog – 6 sc. Row 23-26: Ch 1, turn, sc in each st across. Fasten off, leaving a very long tail. Row 1: Ch 11, sl st back across – 10 sl st.
Row 1: Ch 31, sl st back across – 30 sl st.
Row 1: Ch 26, sl st back across – 25 sl st.
1. Stuff the parts firmly with polyfill. 2. Sew the HEAD onto the BODY. 3. Sew the snout onto the face. The bottom of the snout lines up with where the head and body meets up. Make sure the snout is directly above the line of color changes on body. body. The top part of the belly patch lines up with the bottom of the snout. patch near the bottom of the body. It will look like a diagonal line (See photo). as a vertical going down against the line of the belly patch. 7. 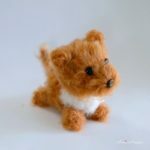 Sew nose onto snout and embroider the mouth. 8. Cut 2 black felt circles for the eyes. Glue on with Fabri-tac. 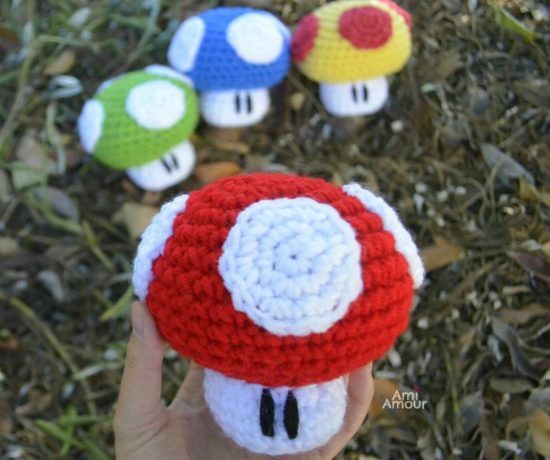 You can also sew on instead if you prefer. Placement: 2 rounds above the snout. 9. Sew on ears on top of the head. 10. Sew the Stripe As onto top of head. Placement: Between the ears. 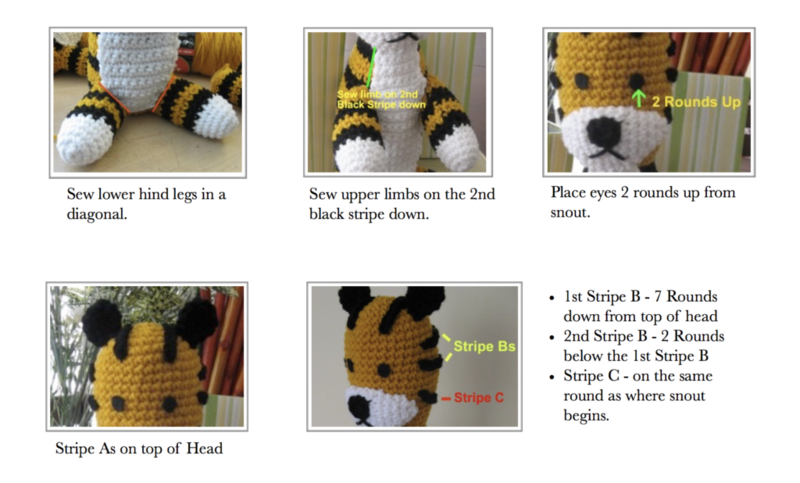 placement: sew 2 Rounds below the first B Stripe. 12. Sew Stripe C onto head. 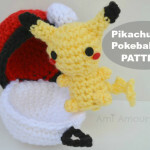 Placement: Sew onto the round where the snout begins. 13. 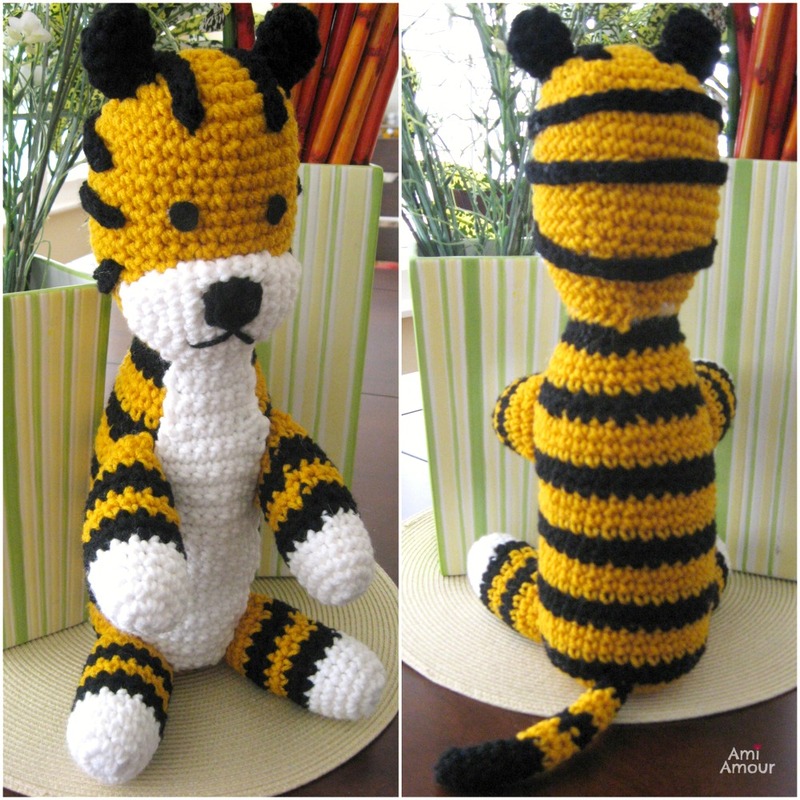 Sew tail on the back of the tiger. 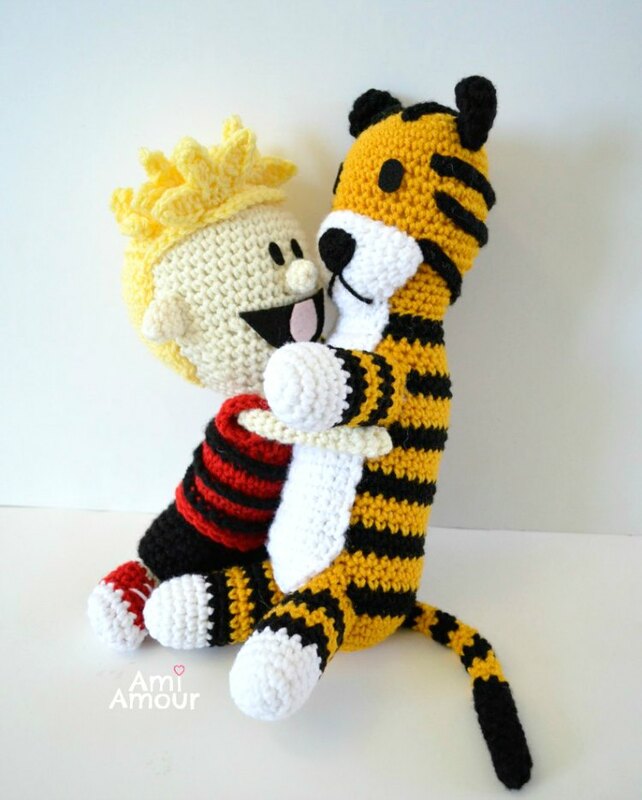 I’d love to see how your Hobbes turned out or if you cosplayed with Hobbes! 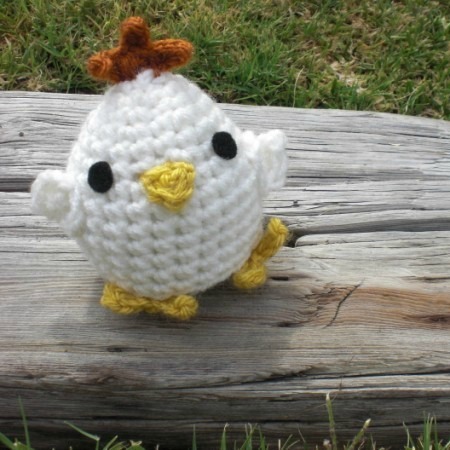 If you liked this pattern, you may also like my Gromit Amigurumi Pattern. 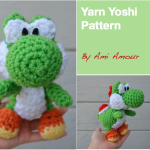 Be sure to subscribe by email so you won’t miss any of my patterns! And don’t forget to tag me on my Instagram or Facebook.